The title of this article is a reference to the historic Coca-Cola advert. Whilst I’m not sure I’d class it as the Christmas season yet, it’s pretty clear that retailers think it is. 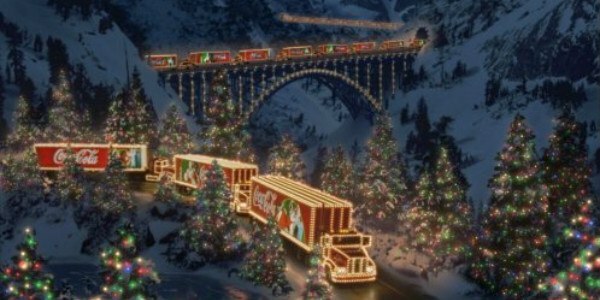 The Coca-Cola Christmas ad – what isn’t Christmassy about HGV’s driving through the countryside? Here in the UK, many shops have had Christmas stock on sale for over a month now, only taking it down for a brief interlude to replace it with Halloween and bonfire night stock. In just over two weeks, it’s the infamous Black Friday, which is meant to be when the Christmas shopping rush really gets started. One of the key moments in British Christmas is now when the main Christmas advertisements start showing. I’ve yet to see the iconic Coca-Cola ad, but last Friday saw the launch of the festive John Lewis ad. Over the last decade, John Lewis’s Christmas adverts have become rather famous and somewhat of a seasonal event. Each year the public sceptically awaits the ad to see if it’s going to better last years. This year’s tells the heart-warming (as always!) story of a little girl and an elderly man who lives on the moon. This years attracted the usual attention. #ManOnTheMoon was the number one trending topic in the UK for most of ads release day (last Friday) and it was instantly parodied. Here are some of my favourites. Firstly a Royal Mail undeliverable note. What about The Martian, Matt Damon? So the real question is: is this excitement just retailers trying to encourage us to spend more money? I’m not sure many people would argue in favour of Black Friday being an event that spreads Christmas cheer, but is there anything wrong with a festive advert pulling at your heart strings? Genuine happiness creation, or just a clever marking ploy? P.S Next time you’re in a food retailer, why not ask an assistant if they have any Christmas spirit in stock!